The use of a ready-made implant is not able to achieve a good fitting in the undersurface with the dorsum of nasal bone and cartilage. This could be one of the causes for malposition of the implant or visibility of implant contour. 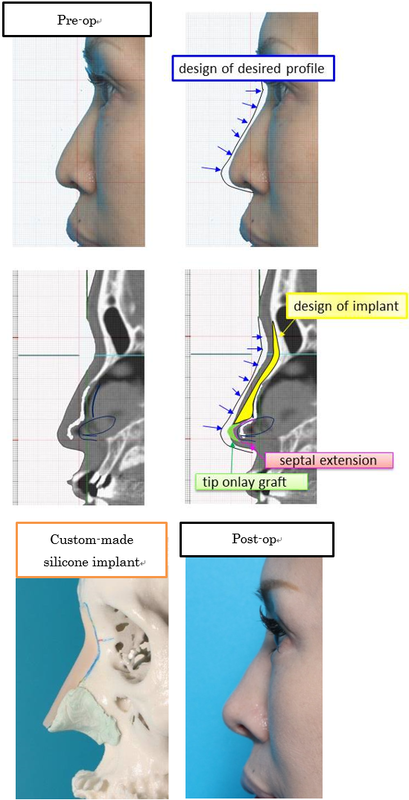 This paper presents our current effort to use a custom made silicone nasal implant. 3D skull model is manufactured based on CT-scan in each patient. The contour of the upper and lower lateral cartilage was traced manually on the CT slice data. Thus, the shape of nasal cartilage was incorporated in the 3D skull model. The thickness of the implant is designed base on the life size photo of the patient’s profile view and mid-sagittal image reformatted from the CT data. The implant is made using epoxy resin, which is used for hobby craft on the 3D model according to the planned thickness. It is essential to make the bilateral side gently tapered to avoid any step at the junction between the implant and nasal hard tissue. After hardening of epoxy resin, the model is duplicated with silicone with aid of Keosan Trading Company (www.ekeosan.com, South Korea). The implants we made were not only for nasal dorsa augmentation, but also for the augmentation of nasal dorsum, glabella and forehead. We have also designed a prototype for septal extension with dorsal augmentation. Our clinical experiences of various types of nasal implants will be demonstrated in details.